The Stated Truth » Brace Yourself, The Shaking Is About To Begin…Magnitude 6+ Earthquakes Around The World Are Overdue, The End Result Won’t be Good! Brace Yourself, The Shaking Is About To Begin…Magnitude 6+ Earthquakes Around The World Are Overdue, The End Result Won’t be Good! A Series of overdue high magnitude earthquakes are simmering along some of Earth’s major fault lines, an expert says. UTS Geotechnical and Earthquake Engineering senior lecturer Dr Behzad Fatahi said “no one in the world is safe” from the looming natural disasters of potentially apocalyptic proportions. “There are a lot of magnitude 6-plus earthquakes overdue in the Middle East, India, China, Japan and the US,” Dr Fatahi told news.com.au. “There are some fault lines that have not released their energy for a while. “There are at least 5-10 that are overdue, but we don’t know when they’re going to happen. “The question is not will they be activated. The question is when.” Dr Fatahi said there was a “return period” for earthquakes and those that didn’t strike within the expected time frame only came back stronger. He said an example of this was the 7.8 magnitude earthquake in Nepal that left more than 8000 people dead in April last year. “You expect a particular fault line will be activated every 100 years or 500 years,” he said. “If the period is longer we expect higher magnitude earthquakes … looking at the history of some of those major fault lines, some are very overdue. “The return period has passed but the earthquakes haven’t happened. Earthquakes claim tens of thousands of lives all over the world each year. That was the case in central Italy, when a 6.2 magnitude earthquake struck the regionon Wednesday. More than 257 people died and many more were injured. Rescue workers are racing against the clock to find people trapped under rubble, but hope is diminishing as reports of voices from under collapsed buildings drift off. “The Eurasian Plate and African Plate both have a very big fault line where they meet somewhere under Italy … this is what caused the earthquake (on Wednesday),” Dr Fatahi said. Tectonic plates are giant slabs of rock that make up the earth’s upper crust (lithosphere) and move, float, and sometimes fracture, causing continental drift, earthquakes, volcanoes, mountains, and oceanic trenches. 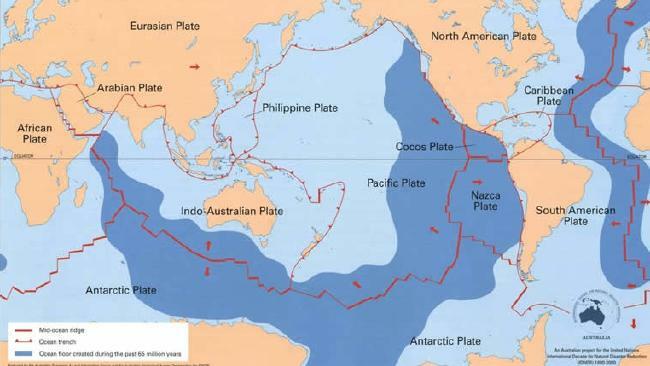 Seismic activity is most common around the edge of the Pacific Plate, which takes in New Zealand, Vanuatu, the Solomon Islands, Papua New Guinea, Japan and the Americas, and in Indonesia, where the Indo-Australian Plate collides with the Eurasian Plate. The San Andreas fault line in California is the longest in the world. It sits between the Pacific and North American plates and measures 1300kms. The depths of these collision zones can range from 0-700km. Some countries, including Japan, Chile, Mexico and New Zealand, lie on the ‘Ring of Fire’ — a horseshoe-shaped band of fault lines that circles the Pacific Basin and is prone to frequent earthquakes and volcanic eruptions. “The earthquake in Japan in 2011 was above a magnitude 8 and caused a tsunami and the melting down of the nuclear power plant and so on,” Dr Fatahi said. There is an earthquake every minute, according to Dr Fatahi. But it’s mostly those stronger than a magnitude 6 that tend to cause significant destruction and loss of life. For every numberhigher, the earthquake is 30 times stronger, he said. Peru, also on the ‘Ring of Fire’, was struck by a magnitude 7.9 earthquake on August 15, 2007. Its epicentre was on the central coast, just west of the major city of Pisco. It killed 595 people. Earlier this month, a moderate 5.3-magnitude earthquake in Peru killed at least four people including a US tourist and left 68 injured, crushing villagers under rubble and blocking roads. The quake knocked down about 50 homes and cut off roads and power in the southern Arequipa region. “It was tragic. They got wounded people out as best they could,” said John Rivera, a resident of Yanque, a hard-hit rural village of mud huts. New Zealand has endured more than its fair share of earthquakes. New fault lines emerged there as recently as September 2010 when Christchurch was struck by a powerful 7.1-magnitude earthquake. The quake smashed buildings, cracked roads, twisted rail lines and ripped a new 3.5 metre wide fault line in the earth’s surface. This week’s 6.2 magnitude earthquake in central Italy killed at least 247 people and injured many more. It occurred 1,937 years to the day since Mt Vesuvius erupted in 79AD and destroyed Pompeii and Herculaneum — one of the most catastrophic volcanic eruptions in European history. More recently, a 2009, 6.3-magnitude earthquake in the Aquila region, about 90km south of the latest quake, which was felt in the Italian capital, left more than 300 dead. That disaster led to lengthy recriminations over lax building controls and the failure of authorities to warn residents that a quake could be imminent. Another quake hit the northern Emilia Romagna region in May 2012, when two violent shocks 10 days apart left 23 people dead and 14,000 others homeless. Associate Professor of Earthquake Science in the School of Earth Sciences at the University of Melbourne, Mark Quigley said central Italy was experiencing “crustal extension”. “Eastern central Italy is moving to the NE relative to Rome,” Mr Quigley said. “As a result, this region experiences normal faulting earthquakes as the land is torn apart. The fault systems are short and structurally complex, so the earthquakes are not overly large by global standards (almost always < magnitude 6.8 to 7). While Australia is not on the edge of a plate, the continent experiences earthquakes because the Indo-Australian Plate is being pushed north and is colliding with the Eurasian, Philippine and Pacific plates, according to Geoscience Australia. This causes the build up of mainly compressive stress in the interior of the Indo-Australian Plate which is released during earthquakes. “Australia is right in the middle of a plate and it’s not sitting on a major fault line,” Dr Fatahi said. There are on average 80 earthquakes of magnitude 3.0 or more in Australia each year. Adelaide has the highest earthquake hazard of any Australian capital. It has experienced more medium-sized earthquakes in the past 50 years than any capital because South Australia is being slowly squeezed in an east-west direction by about 0.1mm/yr, according to Geoscience Australia. Australia’s largest recorded earthquake was in 1988 at Tennant Creek in the Northern Territory with an estimated magnitude of 6.6, but it occurred in a sparsely populated area. A magnitude 6.5 earthquake at Meckering in 1968 caused extensive damage to buildings and was felt over most of southern Western Australia. Earthquakes of magnitude 4.0 or more are relatively common in Western Australia with one occurring about every five years in the Meckering region. The deadliest earthquake recorded in Australia was in Newcastle in 1989. The 5.6 magnitude quake killed 13 people and injured many more. It was one of the country’s worst disasters. Dr Fatahi said it was impossible to accurately predict the exact timing, place or scale of an earthquake. “Usually with earthquakes you can only measure them around one minute before they happen, as the activity happens kilometres below ground,” he said.